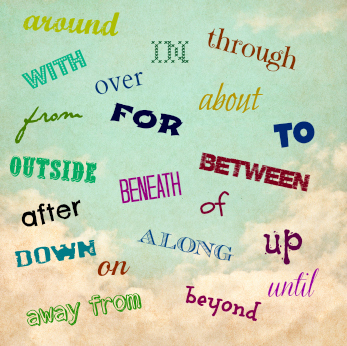 Prepositions are one of eight parts of speech and one of the most difficult to define. They are mostly little words that show relationship in time or space. That’s not an easy concept to grasp, especially for younger students. And since there is a limited number of prepositions in English, it’s common for teachers and homeschooling parents to require their students to memorize them. There are several tricks to help memorizing them, including a variety of songs. I’ve found preposition songs to the tune of “Yankee Doodle Dandy,” “The Battle Hymn of the Republic,” and “If You’re Happy and You Know It.” Other teachers have created their own little ditties or simply have students memorize the list alphabetically. Some have even choreographed hand and body movements. There are at least 150 words that can be used as prepositions. No matter what method you choose, that’s a lot of words to memorize. Is it worth the effort? 1Learning the parts of speech is an important starting point for understanding grammar. Memorizing prepositions ensures that students thoroughly know at least one of the eight parts of speech. 2The function of prepositions in a sentence is subtle and hard to explain, especially to young students. It’s easier to teach them to identify prepositions by sight than by how they function in a sentence. 3There may be 150 or more prepositions, but only 50 or 60 of them are common. That’s not too much to ask. 4My kids like to memorize and the songs are fun. 1Grammar is (relatively) important. The point of learning grammar, however, is to understand how language works — how words and word groups operate together to create meaning. Memorizing a list doesn’t help students understand how prepositions work. 2The job of a preposition isn’t that hard to explain, even to young students. Visual aids like the mouse and his hole or the bird and the cloud can make the concept easier to grasp. If you teach prepositional phrases, including the idea that prepositions always have objects, kids start to recognize them easily. 3The complete list of prepositions IS long, and teaching only a partial list leaves students at a disadvantage when they encounter prepositions that aren’t included. Teaching them to recognize prepositions by function rather than by memorization avoids this problem. 5Some kids dislike memorizing (not many, from my experience, but some), and even though there are many exceptions, the songs don’t typically remain in long-term memory. I can still reel off all the prepositions that start with a from the list I had to memorize more than 30 years ago, but the rest have faded away. My conclusion? I don’t recommend it. There’s not much harm in memorizing the prepositions, but I have found it causes confusion when it comes to prepositions not on the list and adverbs that look like prepositions. Your comments, questions, and suggestions are always welcome! I am homeschooling this year for the 1st time (4th & 6th graders) and the idea of memorizing prepositions is new to me. I appreciate the article and the discussion/comments as they give me choices and food for thought. Thanks! So glad to hear it. All the best in your homeschooling journey, MaryBeth! Memorizing can be a kind of learning. I appreciate your treatment of the issue Brian. I also think a partial list committed to memory doesn’t offer many benefits. The real issue is why are teachers asking students to do this. When I ask teachers this, they often tell me it strengthens students’ writing. But writing researchers have found a negative relationship between grammar instruction like this and writing quality ( see Hillocks, 1986; Graham & Perrin, 2007 for reviews). So I find myself wondering about the teachers’ objectives and how the instructional time could be better spent doing something more meaningful. Thanks for the comment, dc. I will check out the article. I understand the concern about the correlation of grammar knowledge and writing skills. Clearly we should all be more concerned about developing writers than about developing linguists. But I believe there is some intrinsic benefit in studying grammar even if it doesn’t have an immediate or material effect on writing. That said, I don’t know of any writer or editor who doesn’t highly value and regularly use a knowledge of basic grammar. I have often said that studying grammar in and of itself will not make for better writing, and teachers too often teach grammar because it’s more concrete and objective–and less time consuming–than teaching writing. But I think grammar ought to be taught. It should be taught better than it has been and it should not substitute for fundamental writing instruction and practice. But it should be taught. I just don’t think memorizing prepositions is an effective way to teach it. No, dc. It strengthens their command of word choices, i.e., when to use a nominative case or an objective case pronoun. I actually disagree. I teach middle school language arts and I’ve found that my students do much better identifying prepositions when they have memorized them. They will confuse them as adverbs occasionally, but the mistake is rare and usually occurs when they are not really paying attention. We learn 44, nine each day, through repetition and, even in 8th grade two years later, my students still benefit from having learned them in 6th grade and can say most of them. Thanks for being willing to express your disagreement in a reply. I love hearing from people with a different perspective. When I don’t hear any arguments, I wonder if anyone is paying attention. I’m glad that memorizing the list has helped your students. In fact, I’m just glad you are teaching parts of speech! I learned that a preposition is ‘anywhere a cat can go’. It doesn’t quite work for prepositions like of, but it is a good starting point. And with three cats in our house, my daughter has a lot of visual reminders. Devices that that can be very helpful, huh, Rebecca. Thanks for sharing yours. JJ is correct, Lois. Prepositions always have objects — they always create a prepositional phrase and show the relationship of some part of the sentence to a noun or pronoun (the object). Thus, in the sentence “He lives up the street,” “up” is a preposition. “Street” is its object and “up the street” is the prepositional phrase. But in the sentence “He looked up just in time,” “up” is an adverb modifying the verb “looked.” It has no object. Another way of thinking about an object is to ask “what?” after “up.” In the first sentence “up what?” would get the answer “the street.” In the second, “up what” makes no sense. That “up” doesn’t have an object. Thus, it’s not a preposition. Anyway, I bet more people are wondering this kind of thing too, so I’ll do a new post on it. Thanks for the idea! When us “up” a preposition? I think of up and down as adverbs because they describe “how” in a way. The preposition words would be above and below,, or over and beneath, wouldn’t they? I am not completely sure about this, but it is my understanding. I’m aware of all of this, Sue. What’s your point? Leave a Reply to shaun j b Click here to cancel reply.